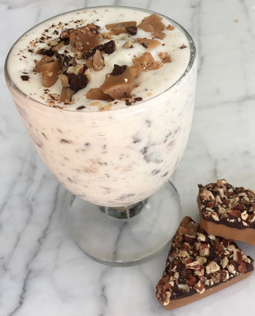 B.toffee Milkshake - A recipe from Savor California, the online showcase for extraordinary gourmet foods and beverages from California. Combine the vanilla ice cream and milk -- or espresso -- in a blender until smooth. Stir in most of the B. bits, and then top with the remaining toffee. More B.toffee on the side, optional!